The Spektrum™ AirWare™ software that comes in the DX18 offers all the programming features an expert pilot could want. And the intuitive SimpleScroll™ interface makes navigating menus and changing settings as simple as “roll and click.” It’s almost like using a mouse. Many Spektrum AirWare features are innovations you won’t find anywhere else; innovations that make flying safer and programming easier. In addition to extensive airplane and heli programming, the DX18 has the most impressive sailplane programming features you’ll find in any handheld transmitter. Ten available flight modes, 5 wing types, 3 tail types, 2 motor types, flap delay with elevator compensation – it has it all. You even have the ability to adjust individual servo characteristics (end points, travel, center, etc.) for all 18 channels. 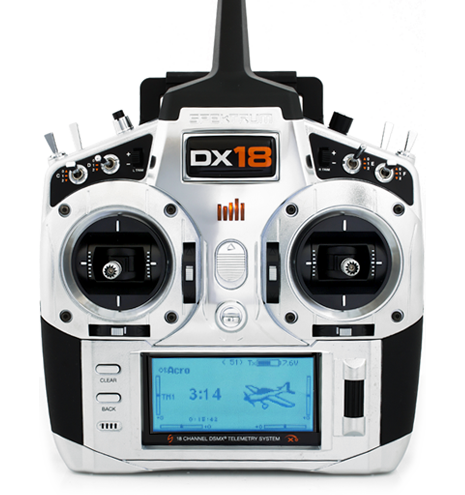 The enormous capacity of the DX18’s on-board memory means you will rarely, if ever, need to juggle models between transmitter memory and your SD card. The model memory menu is easier to navigate too. Only memory slots with model settings saved to them will appear. You won’t have to scroll through empty slots or move models around if one is deleted. Because this DX18 uses the same software platform as the DX6 Gen 2, DX7 Gen 2, DX9 and DX18 Gen 2, you can share model setups with owners of those transmitters as well. Register your DX18 and receive alerts whenever Spektrum Airware™ software updates are available. Built-in telemetry gives you real-time information on things like your model’s battery voltage, signal quality, engine or motor temperature, airspeed, altitude and more. You can have the DX18 alert you whenever any of these parameters exceed limits you define. You also have the option of logging telemetry data to the transmitter’s SD card for review after the flight.